American TV aficionados have enjoyed the ability to watch TV shows and movies online at no cost for several years, using Hulu. Now, the company behind the service has made Hulu Plus, Hulu’s paid-for subscription-based plan, available to Japanese customers. Hulu is an online video streaming service which first became available in the United States in 2008. The service gives all users within the US free ad-supported access to standard-definition movies and TV shows from many of America’s main content providers, ranging from NBC to FOX and Comedy Central. In addition to the free service, Hulu also offers Hulu Plus, a subscription-based service that offers more content than its free offering in high definition, as well as the ability to stream to many devices such as game consoles, set-top boxes and smartphones, all for a single monthly fee. As we’ve done in the U.S., we will rapidly and continually add content to the service. The content lineup will only become more robust over time, including the addition of Japanese-produced content and content from across the Asian region in the near term. The service will be available for ¥1,480 per month, which is the equivalent of nearly $15, almost twice the price of the American service ($7.99 per month). Yet, given the expensive international licensing deals, it might still be worth it, considering the wide array of TV and movies that Hulu Plus will provide to Japanese customers. 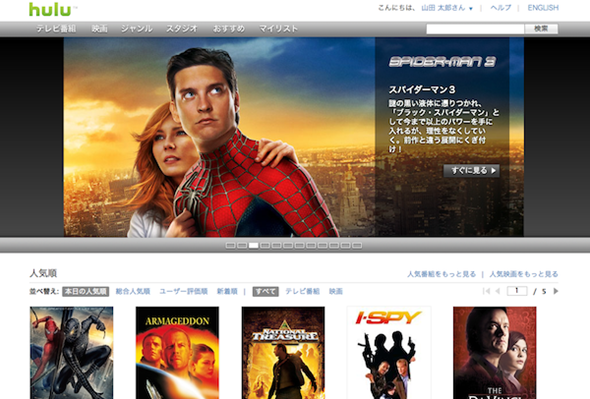 If you’re based in Japan you can subscribe today by heading to Hulu’s new Japanese site. Hulu promises to reach out to other countries soon, although that will depend on whether content providers will choose to get behind it. Still, as more of us drop the cable service, they might not have too much of an choice.